The system is powered by a dual-core 5th generation Broadwell 2.9 GHz Intel Core i5 processor. The 5th-gen Broadwell processor uses low voltage for improved battery life without sacrificing performance. The MacBook Pro with Retina Display also has 8GB of onboard 1866 MHz LPDDR3 RAM, 1TB of PCIe-based flash storage and an SDXC media card slot. You'll be able to connect to the Internet with high-speed 802.11ac Wi-Fi. The MacBook Pro also supports a/b/g/n Wi-Fi networks as well. The MacBook Pro also features built-in Bluetooth 4.0, which allows you to connect wireless headphones, keyboard, mice and other compatible peripherals without a hassle. The 5th-gen Broadwell Intel Core i5 processor with 14 nm architecture in this MacBook Pro provides fast dual-core performance. Intel Hyper-Threading technology allows two threads to run simultaneously on each core. The dual cores can run at a stock speed of 2.9 GHz. The processor can be overclocked up to 3.3 GHz, thanks to Intel Turbo Boost 2.0 technology. 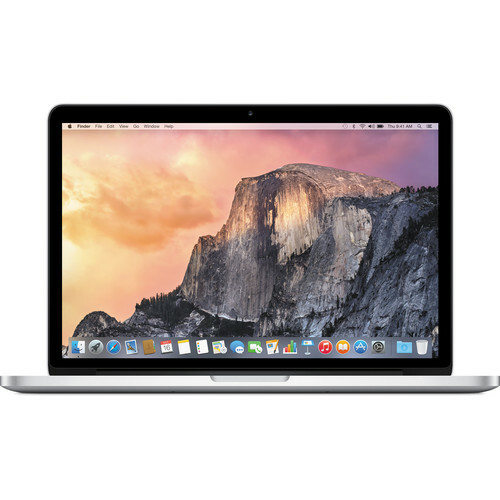 With a 4MB L3 cache and 8GB of onboard 1866 MHz LPDDR3 RAM memory, this MacBook Pro can run professional applications like Aperture and Final Cut Pro with ease. Box Dimensions (LxWxH) 16.4 x 12.9 x 4.1"